AU-shaped glacial valley, Pacific Valley is a scenic stop, a favorite of photographers, hikers, and campers. The valley was shaped during the Ice Age from a glacier that spilled north from the Highland Lakes region. 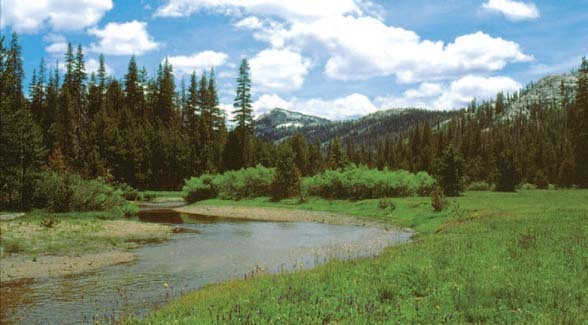 Pacific Creek wanders through the meadow, where a U.S. Forest Service campground is located. The valley is host to a variety of wildflowers in the early summer months, and a major trail network including hikes to Bull Run Peak and Henry Peak, volcanic remnants, departs from the south end of the valley. What is perhaps the oldest existing log cabin on the Ebbetts Pass route is located at Pacific Valley. Denoted by the initials A.G. and the date 1856, the cabin may have been built by Augustus Gebhardt, a butcher from Calaveras County. In the early days, butchers owned their own livestock, keeping them on their foothill ranches during the winter and spring, and taking them to the high country meadows to partake of the green grasses in the summer months. The cabin is currently leased by the Whittle family of Angels Camp as headquarters for their summer range. Other cabins in the valley date to a late 1920s summer home tract. A side trip on the Pacific Valley Road is a scenic venture, where you can picnic or camp beside a meandering creek, or opt to throw a fishing line in.